Director: Florian Henckel von Donnersmarck. Cast: Sebastian Koch, Ulrich Mühe, Martina Gedeck, Ulrich Tukur, Thomas Thieme, Hans-Uwe Bauer, Volkmar Kleinert, Marie Gruber. Screenplay: Florian Henckel von Donnersmarck. Generally speaking, if you drop the adjective "Best" and replace it with "Most," you come to a better understanding of what the Academy Awards are often about. "Most Editing" would be an apt label for the kinds of movies that win trophies for being so obviously "edited," particularly through action scenes or across multiple plot-strands, that even audiences who rarely think about film editing sit up and take notice. "Most Sound" and "Most Sound Effects" would explain the lingering fascination with explosions and submarine pings rather than subtler work connected to mood or character, and "Most Visual Effects" is even more self-explanatory. "Most Original Score" works if we parse "Most" not onto "Original" but onto "Score," since the compositions possessed of the greatest uniqueness and creativity rarely win or even get nominated, but movies crammed with music often do, even when the winning composer wrote almost none of it (see: Babel). Actors are often rewarded for doing the Most Acting, especially in the Supporting divisions, since "Most" connotes both the fussiness of one's thesping (just ask Renée Zellweger and Tim Robbins) and the awful-lotta screen time that nominees like Jamie Foxx, Jake Gyllenhaal, Cate Blanchett, and Natalie Portman tend to have over truly "supporting" actors. "Most Foreign Film," however, absolutely doesn't apply, because Oscar likes to honor films produced abroad that fit as well as possible with Hollywood's own model of filmmaking, or at least with the Academy's consolidated sense of "global" values: the haunting power of the past (Indochine, Burnt by the Sun), the absurdity of war (Life Is Beautiful, No Man's Land), the pluck and sexiness of women everywhere (Antonia's Line, Belle Epoque, All About My Mother), the preciousness of children (Kolya, Tsotsi, and several of the above). "Best Foreign Film" actually translates to "Least Foreign Film," which is why it's always a pip when something as inscrutable to American tastes as The Man without a Past gets nominated, and why it's even more hilarious but also poignantly optimistic when pictures as outrageously different from how Americans imagine the movies and the world as Atanarjuat or The Celebration or In Praise of Love or The Wayward Cloud are submitted for consideration by their home countries. This year, Oscar got excited about two fables of 20th-century European political history, both of them saturated with affection for Hollywood archetypes and production values, and increasingly willing to sacrifice cultural specificity and appealing complexity to overdetermined scenarios and "universal" intimations. One of these was Mexico's Pan's Labyrinth, directed by frequent Hollywood hired-hand Guillermo Del Toro. That movie, still playing to ecstatic audiences, lured a pretty young girl through an elaborately mounted double-narrative of green-tinted violence above the ground and burgundy, sepia, and gold adventures below the soil, all to the effect that You Never Know What's Really Happening, But Fascism Is Definitely Bad, and Resistance Is Definitely Good. 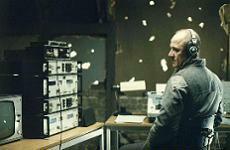 The main competitor and ultimate victor of the Oscar was The Lives of Others, the tale of a Stasi surveillance officer (Ulrich Mühe) who spies on a popular playwright (Sebastian Koch) and his glamorous actress-girlfriend (Martina Gedeck). The spy finds himself going out on ever more precarious limbs to protect these ostensible "subversives" but, perhaps betraying too much of a lockstep apparatchik's belief in pre-emptive causes and well-ordered effects, he fails to see that the situation, that life, may be bigger than he thinksboth more arbitrary and more forcibly controlled. The Lives of Others is too well acted, too convincingly production-designed, and too intricately written to be a bad movie, but it's also insufferably formulaic, with very little to impart by its end beyond a limp and hopeful endorsement in humanity's goodness that calls to mind Steven Spielberg much more than it does Anne Frank. Perhaps it sounds stingy and spoiled to ask why writer-director Florian Henckel von Donnersmarck has immortalized a story about a Stasi agent whose compassion is awakened, and to an unusually pro-active degree at that, when history is so burdened by the hundreds of thousands of Stasi informants who never saw or at least never recanted on the error of their ways. It is easy, indeed, to pretend that The Lives of Others is a more sentimental and quietistic film than it in fact is, since the holistic sense of dread, paranoia, and dehumanization in East Germany is so potently evoked, and short scenes like those involving the playwright's silent and terrified neighbor are so piquantly eloquent about larger social problems of coerced complicity. Still, The Lives of Others is remarkably schematic, surely to a fault, in a way that any number of screenwriting instructors might tout as top-flight organization but which rang in my ear as mechanistic, predetermined, and designed to pacify and corroborate rather than provoke our assumptions about how surveillance operated and who kept the machinery running in a country like East Germany. Von Donnersmarck concentrates the action in 1984, with all the attendant Orwellian analogies. The playwright is generically handsome with a thick head of hair, contrasted with the hunched and skeletal Stasi officer, who nonetheless inhabits a higher rung of handsomeness than his repugnant senior officers. The actress, whom Gedeck never quite sold to me as a character instead of a convenient conception, has surely been given that vocation so the screenwriter can feel clever about expanding the film's purchase on notions of Playacting, Scripting, and Deceiving, just like when the Stasi officer draws a chalk-outline plot of the playwright's apartment that looks like one of the non-sets from Dogville. The garret from which the espionage is conducted and the conversations recorded is frigid and bare, whereas the apartment where the artists live, argue, and fornicate is full of ruddy woods and, at least comparatively, warm light. The male protagonist's crises are intellectual and literary; the woman's are primarily sexual, and when she is eventually enlisted toward duplicitous ends, she sure takes to it with the immediate ease of the femme fatale, if also the abject self-beratement of the penitent villainess. These are all the kinds of baseline dualisms and Romantic fallacies that a sophisticated film typically challenges or embellishes, but The Lives of Others, as forthright, functional, and deliberate as Iron Curtain architecture, plays all of this remarkably straight. As far as the narrative strands and histrionic climaxes go, Von Donnersmarck has wrought his plotlines so carefully and placed so many hints and interlocking details around the script that he has drawn attention to his own ingenuity rather than activating any inexorable force of drama or tragedy. In his dogged impersonation of Spielberg's storytelling gifts, he has also inherited the master's weakness for plushy. serial endings and his juvenile belief in the innately redemptive power of art. "You know what Lenin said about Beethoven's 'Appassionata'?" the playwright asks during an utterly non-diegetic moment of plopping down at his piano, and therefore signaling an Important Speech. "'If I keep listening to it, I won't finish the Revolution.' Can anyone who has heard this music, I mean really heard it, truly be a bad person?" The metaphysical status of "good" and "bad" will remain dismayingly clear, dictatingly so, as The Lives of Others moves toward its many-headed conclusion, even as peripheral notes in the script and the editing and in the performance of Ulrich Mühe seem to complicate or hold back from the film's tendency to sentimentalize. One wants to admire The Lives of Others, but one also wants to be surprised by it, and for a movie this full of "plot twists" and psychological double-backs, I can't say I was surprised a single time, neither by a story development nor by an insight or an idea. As parables of East Germany go, Good bye, Lenin! at least had the wit and the moxie to place deception and ritual repetition on the side of the good guy, and to charm the audience while asking actual questions about how far we will stretch and compromise ourselves in order to protect or sustain a loved one (surely the impulse of most political action, the benign as well as the malefic), and the contexts under which a roundly repudiated regime can be remembered with nostalgia (whether sincere, like the mother's, or ironic, like the son's), and the weird avenues by which political regimes and moments in ideology become distilled into aesthetics, objects, and finally commodities: pickle jars, wallpapers, television programs. The Lives of Others, so much more solemn than Good bye, Lenin!, is also much simpler and thick-witted at its center, and the leap it makes from dour historical enactment to melodious humanistic paean lacks the mediating density or complexity that would support the movie through its affecting but unconvincing (albeit literal) change of tune.